Lucille Ball Revisited, Hollywood c1936 سے طرف کی Melvin Hale (ArtistLA). Digital Painting from vintage black&wite photograph, At age 23. 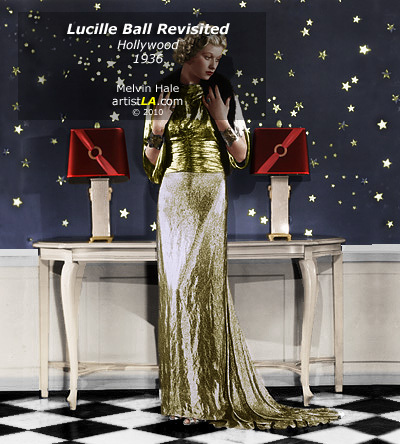 Wallpaper and background images in the Lucille Ball club tagged: lucille ball lucy hollywood film rko lucille ball i love lucy. This Lucille Ball photo contains ڈنر کپڑے, رات کے کھانے کے گاؤن, رسمی, شام کا گاؤن, رات کے کھانے کپڑے, رات کا کھانا گاؤن, گاؤن, gown, bridesmaid کی, غیرت کے نام پر نوکرانی, لوکنی, and نوکرانی کا اعزاز. There might also be چائے گاؤن, کاک کپڑے, میان, کوکٹیل, لباس, گاؤن, روب, gown, robe, and لباس.